Jakarta – PT Toyota Motor Manufacturing Indonesia (TMMIN) today won Primaniyarta Award by the Ministry of Trade of the Republic of Indonesia for export excellence. This is the 6th time for TMMIN to won this award after 2008, 2010, 2011, 2013, and 2014. TMMIN Vice President Director Warih Andang Tjahjono accepted Primaniyarta Award from the President of the Republic of Indonesia His Excellency Joko Widodo accompanied by Minister of Trade Thomas Trikasih Lembong in a ceremony held in Jakarta International Expo (JIExpo) Kemayoran Jakarta, Wednesday, October 21, 2015. “We are grateful for the Indonesian government for the acknowledgement of our export activity. This achievement is only made possible with the support and cooperation of many parties especially from the Indonesia Government whose leadership in pushing export activities through regulation and infrastructure truly make an impact. Primaniyarta Award poses a challenge for us to maintain and increase our performance in production and export to contribute to Indonesia,” said Warih. Throughout Primaniyarta history since 2007, TMMIN is the only car manufacturer able to win this prestigious award for exporters. In the past five years, TMMIN is able to maintain export growth for CBU (Completely Build Up) vehicles from 55,000 units in 2010 to 160,000 units in 2014. TMMIN also exports CKD (Completely Knock Down), gasoline engine, ethanol engine, component, and production support tools such as jigs (support tools for welding), and dies (support tools for pressing). TMMIN export activity starts in 1987 by shipping third generation of the Kijang to Brunei Darussalam. One of the highlights of TMMIN export history came in 2004 when TMMIN becomes one of global production base for IMV (Innovative International Multi-purpose Vehicle) which include models such as the Kijang Innova and the Fortuner. “During TMMIN long history in Indonesia, we have evolve from being an importer in the 70s to be one of Toyota global production and export base in Asia Pacific region,” said TMMIN Corporate and External Affairs Director I Made Dana Tangkas. 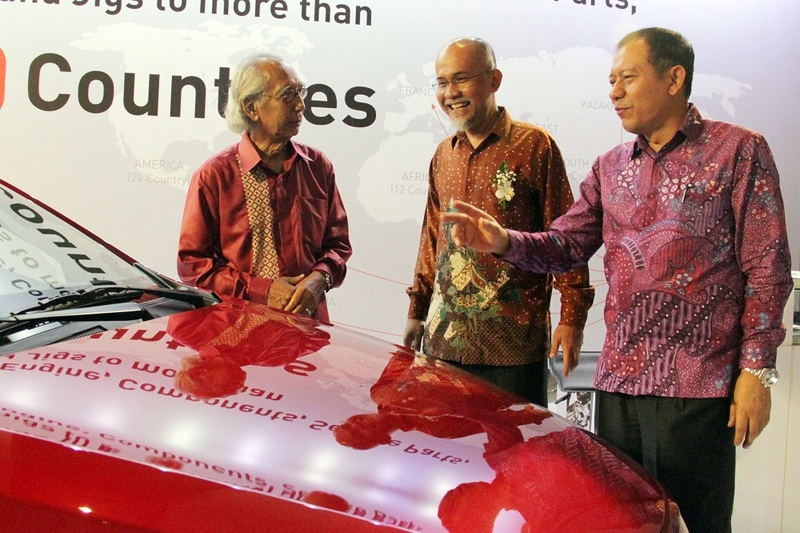 As of September 2015, cumulative volume of Toyota brand CBU export from Indonesia has reached 840,000 units. TMMIN also has exported 770.000 CKD units, more than 1.2 million gasoline engines, and more than 560 million components in the same period to more than 70 countries in Asia Pacific, Africa, Latin America, Caribbean Islands, and the Middle East. Meanwhile, export achievement of Toyota brand in 2015 up to the month of September consist of 139,000 units CBU cars or 24% higher compared to the same period in, 34,000 units of CKD, 34,000 gasoline engines, 7,000 ethanol engines, and 44 million components. TMMIN is targeting a 10% increase in CBU export volume in 2015 compared to the 160,000 units in 2014. On future challenge in export, TMMIN believes that it is very important to increase competitiveness to fulfill domestic demand and to further expand export market. "Various Free Trade agreements provide opportunity for Indonesian industries in term of the opening of export markets, but in the same time, there is a challenge to be competitive also in domestic market from import products. The mission is to develop a strong and competitive industry so we can compete in both domestic and export market,” said Warih. TMMIN continuously improves efficiency and increase the competence of the Human Resources to produce quality products that meet global standards. TMMIN also constantly improve production system that can ensure an increase in the use of local content and the assurance of timely delivery. "In line with government policy to grow exports, the manufacturing industry has begun to play an important role to support export performance of commodity which has been the backbone of Indonesia’s export achievement," said Warih.